Shorty is in the house, and he approves our horsehair hanging ornaments! 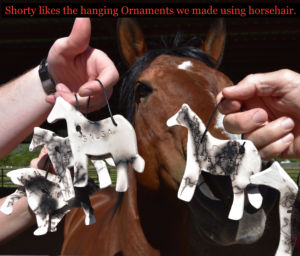 One-of-a-kind handcrafted ornaments are made using hair from your horse or other beloved friend. Your horses name is imprinted in the wet clay. Natural white clay is then fired to 1600 degrees, turning it into stone. Then a few strands of hair (you supply) are flashed onto he surface, depositing rich colorings with their DNA essence. This creates a beautiful ornament you can hang anywhere. Place in your alter or special place, or get a whole set to decorate your next Christmas tree. You will never regret having this handcrafted art, a touchstone of love, to remind you forever of your beloved friend.